Gamma Vaccines is developing improved vaccines against influenza and other important veterinary pathogens. The Company’s technology also provides the potential to create improved seasonal flu vaccines for human use that protect against different influenza viruses and which are effective against any new pandemic strain. 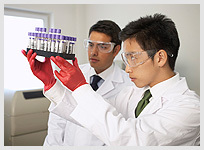 Gamma Vaccines is proudly assisted by Business and Industry Development, ACT Government. TECHINSA Grant Awarded to GPN Vaccines| 17 December 2017THE SOUTH AUSTRALIAN EARLY COMMERCIALISATION FUND ADMINISTERED BY TECHINSA AWARDS GPN VACCINES $300,000. Additional New Director Appointed| 25 July 2011GAMMA VACCINES APPOINTS DR JEAN PETRE AS A NON-EXECUTIVE DIRECTOR. New Director Appointed| 22 June 2011GAMMA VACCINES APPOINTS DR KEN TEMPERO AS A NON-EXECUTIVE DIRECTOR. VacChina 2010| 15 September 2010GAMMA VACCINES CHAIRMAN PARTICIPATES IN THE VAC-CHINA 2010 VACCINE DEVELOPMENT SUMMIT IN SHANGHAI. Director Becomes University of Adelaide Research Fellow | 19 July 2010GAMMA VACCINES’ CSO, DR MOHAMMED ALSHARIFI, APPOINTED AS RESEARCH FELLOW IN THE UNIVERSITY OF ADELAIDE’S SCHOOL OF MOLECULAR & BIOMEDICAL SCIENCE. Commercialisation Grant | 7 July 2010GAMMA VACCINES AWARDED $56,000 COMMERCIALISATION EMERGING TECHNOLOGIES (COMET) TIER 2 GRANT FROM THE COMMONWEALTH GOVERNMENT. Chairman Appointed Honorary Professor | 25 June 2010GAMMA VACCINES’ EXECUTIVE CHAIRMAN APPOINTED HONORARY PROFESSOR BY THE INSTITUTE OF TECHNOLOGY, BANDUNG, INDONESIA. Alternate Director Appointed | 14 June 2010MR “ANDREAS” DJAMWARI NOERSINI HALIM APPOINTED ALTERNATE DIRECTOR TO ENG LIANG TAN. World Vaccine Congress| 11 June 2010	Gamma vaccines chairman gives key note presentation to the world influenza congress (Asia) 2010 in Singapore. Indonesian Vaccine Expert Appointed | 1 June 2010GAMMA VACCINES APPOINTS DR DARODJATUN SANUSI – PRESIDENT-EMERITUS OF PT BIO FARMA – AS A SCIENTIFIC ADVISORY BOARD MEMBER. New Director Appointed | 31 May 2010	GAMMA VACCINES APPOINTS ENG LIANG TAN - PRESIDENT COMMISSIONAIRE OF THE SOHO GROUP – AS A NON-EXECUTIVE DIRECTOR. Sponsorship | 16 April 2010Gamma Vaccines receives sponsorship from the ACT Government’s TradeCon grant scheme to participate in BIO-2010 in Chicago, USA. Commercialisation Grant | 2 March 2010 GAMMA VACCINES AWARDED $64,000 COMMERCIALISATION EMERGING TECHNOLOGIES (COMET) GRANT FROM THE COMMONWEALTH GOVERNMENT. Sponsorship | 26 September 2009 Gamma Vaccines receives sponsorship from the ACT Government’s TradeCon grant scheme to participate in the World Vaccine Congress in Lyon, France. Innovation Grant | 25 September 2009 GAMMA VACCINES AWARDED $25,000 INNOVATION CONNECT (ICON) GRANT FROM THE ACT GOVERNMENT. Universal Flu Vaccine | 18 September 2009 A universal flu vaccine able to protect against a diverse range of influenza viruses including swine and bird flu is being developed by Gamma Vaccines Pty Ltd.